Space junk is a widely known issue frequently covered by media and even the subject of a successful science fiction thriller movie: Gravity. The public has become aware that space debris represent a major threat to human spaceflight and to active satellites, and that even a tiny fragment can be catastrophic by colliding at hypervelocity. One day space debris may wreak havoc on-orbit should they reach a critical level causing a chain reaction of collisions, the so-called “Kessler Syndrome”. What many people do not know is that space debris continuously decay from orbit and re-enter the atmosphere where they further fragment and only partially burn. Surviving fragments can impact anywhere on the globe. A risk for people on ground, at sea or travelling by air, which internet satellites mega constellations will escalate unless actions are taken. Space debris in Low Earth Orbit (LEO), between 160 km and 2000 km, are usually viewed only as an orbital environmental issue, however in recent years awareness of dangers arising upon uncontrolled, also called random, re-entry has started to emerge. Atmospheric re-entry leads to fragmentation and destruction of the re-entering object by friction heating and deceleration loads. Some fragments would disintegrate and totally demise, but others would survive, cross the air space and impact the ground. The risk to people and property from fragments that survive re-entry is small but not negligible, as one might assume. Experts may tell you that risk is very remote and luckily, up to now, no one has been injured or killed. You may be told that the only contact ever made between a human and a falling space debris happened in 1997 in Tulsa, Oklahoma (USA) and it was without consequence. A woman was walking her dog before sunrise when she watched a fireball streaking through the sky from north to south. Half an hour later a slowly falling fragment brushed the lady’s left shoulder and hit the ground with a metallic sound. The debris was from the re-entering second stage of a Delta II rocket that was launched 8 months before. 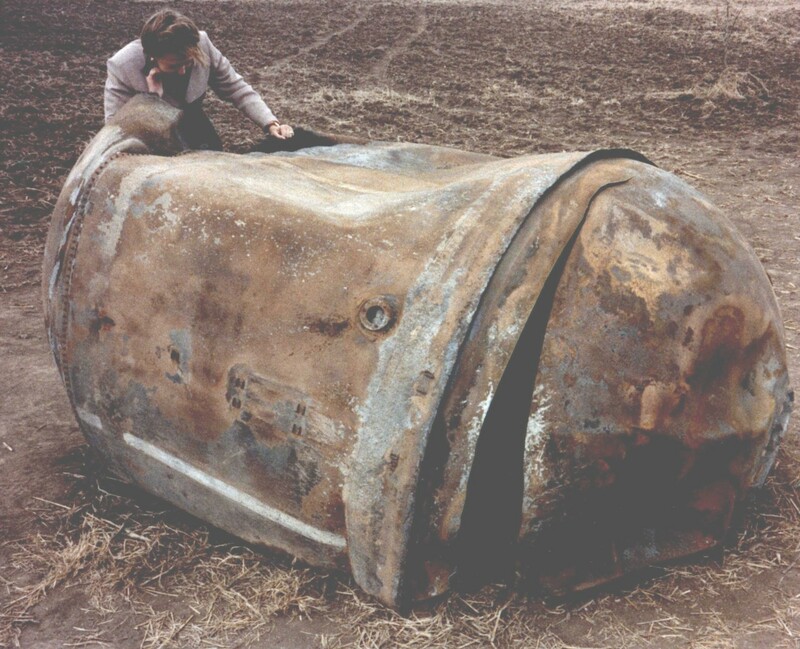 What the experts may not mention is that around the same time, a large 250 kg stainless steel propellant tank from the same rocket landed in the front yard of a farmer near Georgetown, Texas, and outside the town of Seguin also in Texas, a titanium sphere embedded into a field. Reports of similar space debris landings appear regularly in the press in particular for large conspicuous pieces. A rare event? Not at all! Currently about 100 large space debris, including dead satellites and spent rockets upper stages, re-enter the Earth’s atmosphere annually. They range in size from a compact car to a large truck. The Aerospace Corporation of El Segundo (CA) maintains re-entry forecasts on a dedicated website. For many years only very large space structures like Skylab and MIR station or satellites containing radioactive or other toxic materials were deemed significant threats. Many satellites and rocket upper stages re-enter the Earth’s atmosphere, but only a limited number of pieces have been reported and actually recovered. This is consequence of the low probability of impacting a populated area on the Earth’s surface and then for the fragment to be found. When detailed searches for debris were done on a large scale, as was the case following the Space Shuttle Columbia accident, the amount of recovered debris greatly exceeded any expectation. It is commonly assumed that between 10 to 40% of the pre-reentry dry mass of the space system survives as fragments that are large enough to be hazardous to the public on ground. Some limited studies conducted in United States have quantified the annual risk for aviation due to random space debris re-entry in the order of 3 in 10,000 that is above the long term acceptable risk for a flight exposed to such a risk, but below the short term acceptable risk based on risk acceptability guidelines used by the FAA for other types of threats. Surviving small fragments are not considered in this estimation. Small fragments that are non-hazardous for people on ground because of low kinetic energy at impact and/or because of sheltering provided by buildings, houses, cars, etc., are potentially lethal for an aircraft in flight due to relative speed at impact, and because of aircraft inherent vulnerability of structures and systems. A fragment of 300 grams is considered by USAF norms catastrophic for civil airliner. In coming years the number of operating satellites in Low Earth Orbits will increase exponentially. As of January 2015 there are 669 satellites operating in LEO but there are applications filed with ITU (International Telecommunication Union) in Geneva for launching in the coming years about 11,000 satellites, including mega constellations of 4,000 satellites each or more like those planned by US SpaceX, and Norway STEAM-1. Such mega constellations are part of the so-called space-based internet ‘gold rush’ aimed to provide internet access to 3 billion users in developing countries. Internet satellites will be smaller, 150 kg on average, and have shorter operational lifetime, thus requiring frequent disposal and replacement. There are two primary means for disposing of spacecraft and rockets upper stages in LEO: disposal by natural orbit decay that leads to random or uncontrolled re-entry, and disposal by actually deorbiting the object to a known location, so-called controlled re-entry. The cheapest method of deorbiting a satellite or rocket upper stage, which does not require additional fuel or dedicated systems, is to lower the perigee altitude such that atmospheric drag causes the satellite’s orbit to decay at a faster rate within the 25 years orbital lifetime limit required by current international guidelines on space debris. Because uncontrolled re-entries happen at a shallow angle, predictions are very much affected by uncertainties about actual atmospheric density at time of re-entry. Furthermore there are uncertainties on orientation and dynamics of the re-entering hardware. The result is that random re-entry cannot be precisely predicted. At best, predictions have an error of approximately 10 percent in time; that means an uncertainty in the re-entry point of approximately ±2740 km one hour prior to re-entry. Controlled satellite reentry is mandatory when the mass of the (single) satellite is so large that the number of surviving debris objects is thought to pose an unacceptable safety risk. Disposal by controlled deorbit provides certainty in the impact location by targeting the spacecraft to a safe area, generally a broad ocean area, to minimize the hazard to people. To perform a controlled re-entry at the end of the mission it is necessary that the propulsion system is suitable for providing the required delta-V, has sufficient additional propellant and all relevant sub-systems (e.g. on-board computer, attitude control) are reasonably reliable. Design, manufacturing and operations costs are therefore important considerations. Currently satellite reentry risk is treated as a rare event and therefore assessed on event-basis and not on annual cumulative basis. Since the number of surviving fragments directly affects casualty expectation, and such number is a function of spacecraft mass, mission planners use to calculate the risk of surviving fragments on single event basis and compare it with an allowable risk threshold of 1 in 10,000 to decide if random re-entry is acceptable, or if an expensive controlled re-entry is required. Because the mass of each satellite to be used by future LEO mega constellation is relatively small, random satellite reentry would be found acceptable on event basis, but constellation cumulative risk effects would not be accounted for. There is no agreed international regulations on the risk posed by space debris re-entries. The UN Space Debris Mitigation Guidelines, and the ISO standard leave the decision about allowable threshold to national authorities. One country, France, has forbidden by law uncontrolled satellite reentry and re-entries of rockets upper stages with effectivity January 2020. In U.S. there is no discussion about changing the old risk acceptability threshold of 1 in 10,000 per re-entry, which was defined by NASA back in 1997 when space debris atmospheric re-entries were a rare occurrence and cumulative effect were not an issue. For several space faring countries the risk threshold is either the same of U.S. or is unknown. Being internet satellites of upcoming mega constellations rather light, they will easily meet the 1 in 10,000 events risk threshold. Counting the rocket upper stages that will be left in orbit after launching mega constellations, atmospheric re-entries of dead satellites and spent rockets upper stages will become in future a multiple daily occurrence. They would represent an escalating risk for the public on ground, at sea, or traveling by air unless uncontrolled re-entries are banned or new cumulative acceptable risk thresholds defined, managed and enforced at international level. Reentering debris from a mega constellation would pose a very, very low risk. A constellation with 1000 satellite members would possibly need ~10000 satellites to be launched over a 50 year period to maintain it and assuming a ~5-year operational lifetime per satellite. If each one posed a 1-in-10000 on-ground casualty risk then the probability that there would be no casualties from all of those reentries is (1 – 0.0001)^10000, which is 0.37. In other words, the probability that there would be one casualty in 50 years is 63%. For context, in 2013 there were 3000 deaths on the roads of California alone. Worrying about the number of casualties from reentering debris is irrational. True, but it’s really the mass casualty event they will worry about. A chunk that downs an airliner, or hits a refinery pipeline in a populated area. Even there the expectation is much less than for common mishaps, but has that element of imposition, where the persons an Internet satellite took out didn’t choose the risk and maybe didn’t even benefit from the Internet. It is an unfortunate fact that Codes, Standards and Regulations tend to get significantly revised only after some drastic and usually tragic (lethal) event has occurred. Consequently, I do not expect to see any worthwhile action being taken on LEO or re-entry debris until a ‘Gravity’ event actually occurs and an astronaut is killed by a high-velocity debris fragment (NOT a micrometeorite, because we can’t control them), or someone on the ground is killed by a re-entry fragment. Then, like it or not, it will be time for all the spacefaring nations to put aside their differences – and probably a lot of their military secrets – and cooperate fully, in order to achieve a rapid amelioration of the situation. Will it happen? I’m not holding my breath.